Jurassic Park Night Vision Goggles Replica (Chronicle Collectibles) | Nerd Much? While fans of the Jurassic Park franchise eagerly await the upcoming June 22nd release of Jurassic World: Fallen Kingdom, we now have something just as exciting to look forward to, and preorders are already being accepted. Chronicle Collectibles has finally released the first ever fully licensed prop replica of the Jurassic Park Night Vision Goggles used in both Jurassic Park and Jurassic World. Do you remember when Tim discovers the futuristic night vision goggles? A lone goat in the T-Rex enclosure stands in the pouring rain. A foreboding quiet and tension build as Tim finds the “Heavy” and therefore “Expensive” night vision goggles under the seat. The brightly colored and futuristic NV goggles create a sharp contrast against the ominous exterior of the jeep. This scene makes it very clear… All hell is about to break loose. 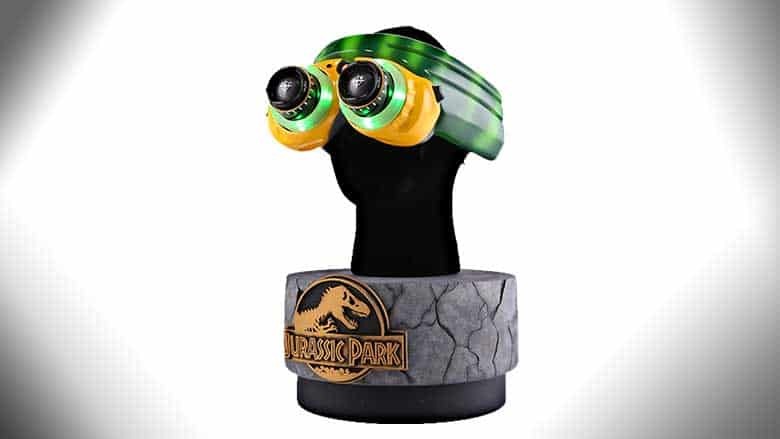 The following T-Rex breakout and ensuing chaos help cement these goggles as an iconic symbol of the film… And now you can amaze and impress with your very own replica pair of Jurassic Park Night Vision Goggles. Complete with light-up features and lenses that open and close, these replica goggles measure 13” long, 9” wide and 7” tall. While they do stop short of night vision capabilities, they are screen accurate to meticulous degree. A carefully researched, designed and developed replica, the creative minds over at Chronicle Collectibles spared no expense to ensure the authenticity of these replica goggles, and the quality shows. In coordination with Universal Studios, they were able to use the actual screen used prop goggles in the design and 3-D printing of the prop replica, even further ensuring authenticity. While currently priced at $449, monthly payment plans are available at just 44.90 per month, interest free. Preorders are already being accepted, and shipping is expected to begin in the first quarter of 2019. Just don’t expect any night vision capabilities – they are a prop replica after all. This content has been exclusively shared to Baaz.